Hi, this is Virginia Lu from Yes, Virginia… blog. I am happy to be back again to share some new stamp projects with the ton stamps. You know, when creativity strikes, you just got to do what you got to do! And this was the case for me with the large cling stamp “Wild Peony Garden”. This 6”x6” inch cling stamp provides endless possibilities. If you see my two cards today, you will know what I mean. My first card is a clean and simple one. I stamped the cling stamp with various colors of inks (with the help of MISTI): pink, orange and yellow. I love using smaller ink pads to ink up the stamp and do selective stamping. Once that is done, I thought it looked really bold, so I “toned it down” with a strip of pattern paper (from Brighton Pier, Studio Calico). I then completed the design with a stapled gold thread and sequins. Easy, huh? Doesn’t this card reminds of you of some celebrity’s designer dress? My 2nd card was created in a bit of an unusual fashion. But the result was totally worth it! I started out with light kraft card stock (from Michael’s), then I inked up the stamp with white chalk ink. I love the look of white chalk ink, but I am not patient enough to wait for the chalk ink to dry. So I clear- embossed it! You can definitely emboss it with white embossing powder. But I like the more opaque and soft look from the white chalk ink and clear embossing. After that, I took the sponges (rolling them up into a small ball) and inked up with Distress Ink one tiny area at a time. In order to add shades and keep the design defined and interesting, I applied bright colors ( Cracked Pistachio, Spiced Marmalade, Ripe Persimmon, Squeezed Lemonade, Mustard Seed). As you may know, this is the so-called “Emboss Resist” technique. It almost never fails to yield to a good result. I applied an SRM Sticker sentiment on vellum and completed it with gold thread and sequins. 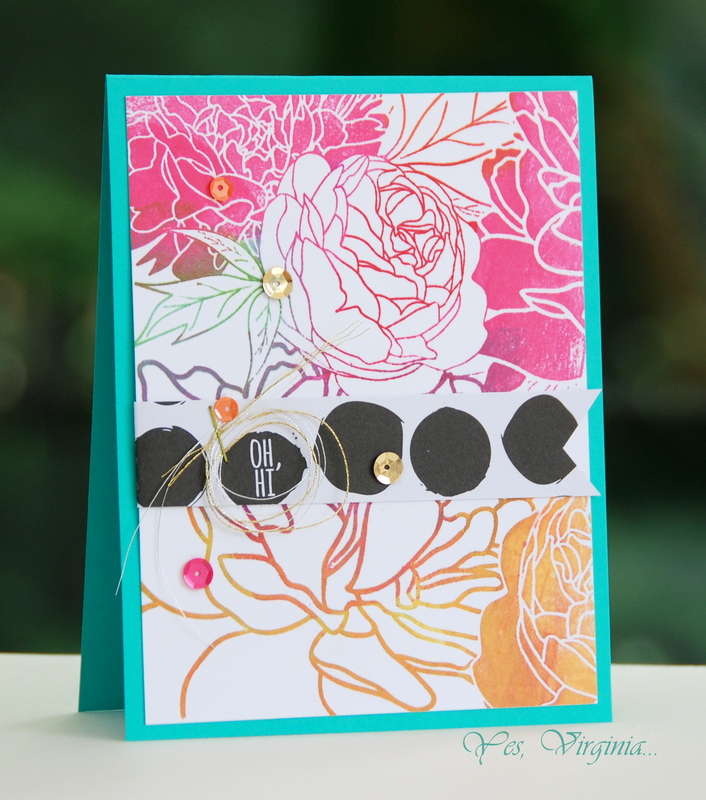 I hope this colorful post inspires you to try a large cling stamp such as the awesome “Wild Peony Garden”. You will be amazed what you can do with it! Thanks for stopping by! 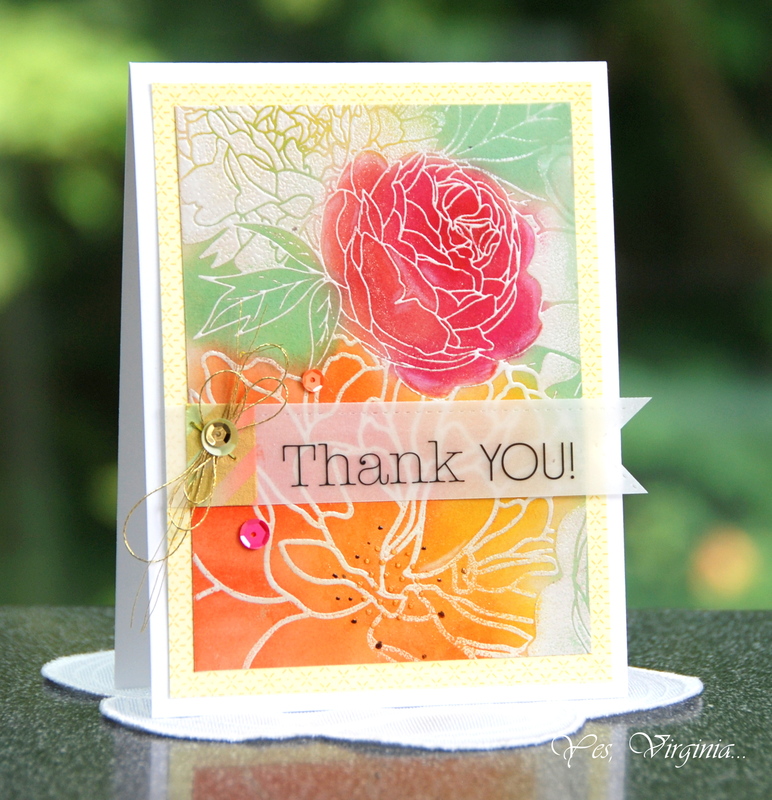 This BG stamp is a party of floral goodness! 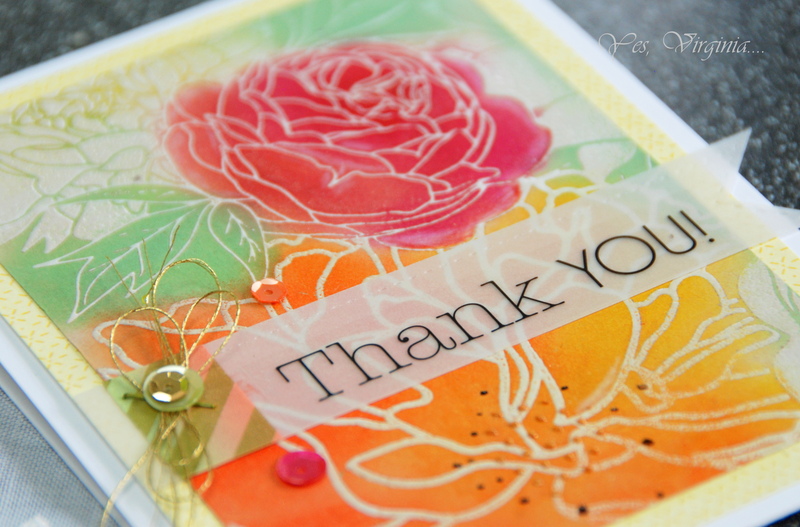 The mix of solid and outlined images dancing together on one stamp is divine! WOW – beautifully done!! Virginia is an artist and she has showcased your products in such a pleasing and gorgeous way!! Thanks for having her – she is remarkable!! Beautiful cards! Love that stamp. Very beautiful cards. Especially the latter – beautiful colors. These are gorgeous, Virginia! I really love the colors on the 2nd card, so yummy! Yay for Virginia! Two stunning cards! Oh my! These cards are just so lovely! And, I can see so many beautiful designs coming from this stamp. It has moved to the top of my “Wish List”. Thanks for sharing your art. Lovely, lovely, Virginia………….your colors are wonderful. I love this card. 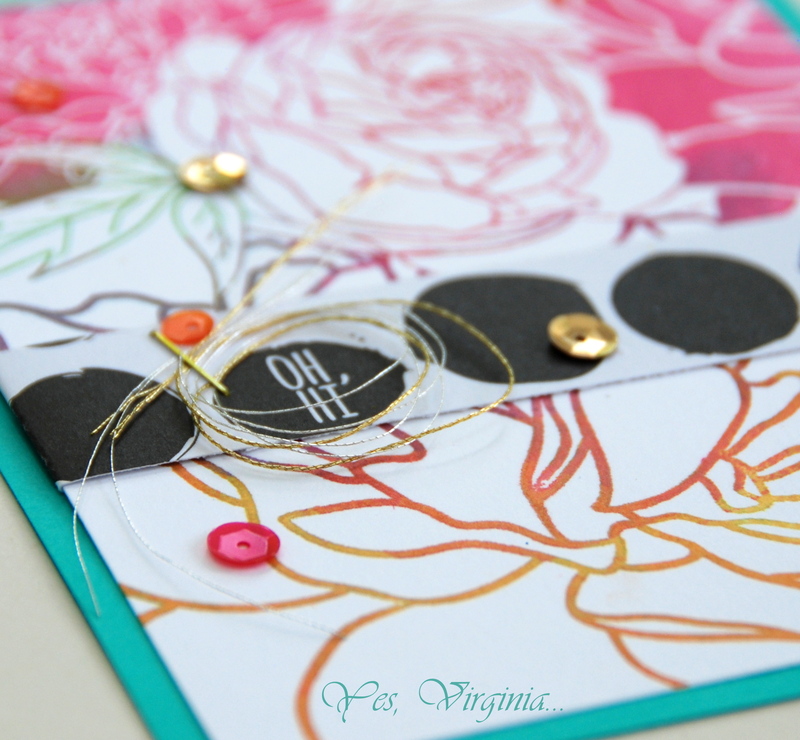 yay Virginia.. both of these cards are stunning.. guest use of color.. Simply stunning, both of them. Yes, the first card is really reminiscent of a celebrities dress I saw recently. Wonder if we’re thinking of the same one. And the second card is nothing short of spectacular with all that gorgeous ink blending ove the embossing. You really done good girl. Congrats on the Guest Designer spot. I adore Virginia’s work! Hope you’ll have her back again!